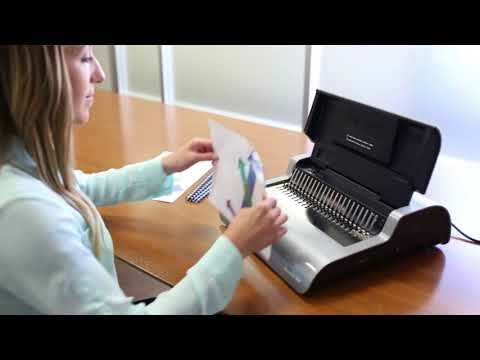 The Fellowes Quasar-E 500 Electric comb binder has 20 sheet punch capacity, 500 sheet binding capacity (50mm comb) and vertical document loading. Starter pack for 10 documents included. The Quasar-E 500 includes a window to the chip tray, full width punch handle, document thickness and comb sizing guide and rotary edge guide adjustment. The punch bar is suitable for left and right handed operators and 2 handed punching. Neon indicators for on/off and overload. The Quasar-E 500 is an ideal capacity machine for heavy duty office use with a durable metal mechanism for longevity. The efficient design permits separate punching & binding and features electric punching for ultimate ease of use. A comb storage tray with patented document measure, allows the user to select the correct comb size quickly and vertical sheet loading ensures consistent punch alignment. The Quasar E 500 is supplied with a chip tray, with burst out feature to eliminate jams and an adjustable edge guide, which aligns sheets accurately. A starter kit for 10 documents is included.